Can I sell a quilt I make from fabric that has licensed images (i.e. Disney, NASCAR, etc.)? Can I sell a quilt I make from a pattern I purchase that is copyrighted? These questions bring up some of the most common – and most confusing – issues involving copyright and quilting. There are all sorts of postings and articles on the Internet that talk about these questions, but I have yet to find a definitive answer. So, I turned to Google Answers to see if I could get some help. I'm posting the answers I received, with my comments in italics. Since I'm not a lawyer, and I am NOT giving any legal advice, the best thing to do in this case is to discuss the situation with a lawyer. Again, I am not giving legal advice – this article contains opinions not expressed by Chuck Smith, QuiltingBusiness.com, or Gruntled Enterprises. So, enough of covering my backside…. on to the answers. Question: Can you sell quilts made from fabric that you purchase when most fabric designs are copyrighted? Answer: The first question is the hardest among the two and there are different interpretations among the side of the fabric makers and crafters (like the quilters) as regards to this issue. Just like in any legal matter, nothing is absolute and not everything is black and white since there will always be exceptions in different cases. This first link goes to an article by eBay Power Sellers Michael Meadors and Karen Dudnikov. They have successfully defended themselves against a number of different lawsuits brought by companies that have licensed their assets for use on fabrics. Mr. Meadors and Ms. Dudnikov have sold items made with licensed fabrics on eBay, and when push came to shove, the licensors have backed off. What this means is that there is precedent for creating a quilt from fabric with licensed images or designs on them, and offereing them for sale. This seems to come under the “First Sale Doctrine” which is part of the current United States Copyright Law. Basically, the First Sale Doctrine states that when a manufacturer of a copyrighted item releases that item into the stream of commerce, the original owner of the copyright loses control of what happens to that particular item. One of the arguments that big companies use to scare quilters and crafters is to refer to these hand-crafted items as unauthorized or unlicensed products. But, this argument is part of trademark law, not copyright law. But, since they are large companies, many quilters are too scared to go up against the big companies and don't use the fabric. â€œPRECIOUS MOMENTS, INC., Plaintiff, v. LA INFANTIL, INC., et al., Defendants. So in a sense, the crafter did not totally won since the latter was still ordered to modify the tags included with the products to properly cite that the plaintiff was the owner of the copyright for the fabric. My take on this issue: You can sell quilts made from licensed fabric, and it fits into the First Sale Doctrine under copyright law. You can probably expect some grief from some of the bigger companies, but use the resources at www.TabberOne.com and you should be OK. Again, this is NOT a legal opinion, nor am I giving legal advice. Question: Can you sell a quilt made from a copyrighted pattern? And if so, what are the restrictions and rules that would apply? The reason is that in the case of a qult pattern, the pattern itself is unavoidably copied and reproduced in the finished product – when you look at the finished quilt, you see a copy of the pattern you created the quilt from. In addition, most quilt pattern copyright holders will put in restrictions on use, so as “for personal use only” or other limiters. This is perfectly legal, and means you cannot sell the finished quilt. But, there may be a way to sell a quilt from a copyrighted pattern. Basically, you need to ask the owner of the copyright if you can sell the quilt. You may have to come up with some kind of profit-sharing plan, but it never hurts to ask. My take on this issue: It's better not to try to sell a quilt made from a copyrighted pattern unless you have permission from the copyright holder. Instead, use public domain patterns or come up with your own patterns. I know this makes things more difficult, but in the end, a lot safer. I know this article may not be the most helpful I've posted, but at least you'll be exposed to a few new information resources to continue your hunt. Again, I'm not trying to give legal advice, and I'm not an attorney. Please consult a licensed attorney if you do have any questions about quilting and copyright. I got it, thank you for i did’nt know that. I have asked permission to show my work that was based on a copyrighted pattern in a few cases. Because I had purchased the pattern, I was asked to give credit for the design in my post, which I did. It was correct to ask for permission and the response was reasonable. We all benefit. The unauthorised reproduction or distribution of this copyright work is illegal. It means to me (though I could have poor knowledge of English) that protected is the work in the magazine (i.e. the description how to make a quilt plus pictures) but not the quilt I made using this instructions and pics. Otherwise it would be prohibited to make quilt – you were only able to read articles and look at the illustrations, isn’t it? these are some really interesting considerations. it makes it hard to be a crafter if you have to always be worried about copyright, when you are just trying to make something nice like a quilt. Next thing you know we’ll need permission to hang a quilt on the clothesline on laundry day…someone might see it! 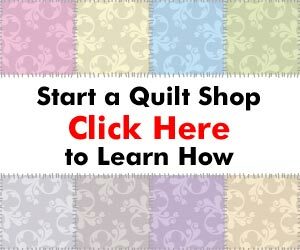 Next post: Are There Too Many Machine Quilting Businesses in My Area?